London, April 4, 1888 ~ Evelina Cooper, niece of Sherlock Holmes, is ready for her first London Season - except for a murderer, missing automatons, a sorcerer, and a talking mouse. In a Victorian era ruled by a ruthless steam baron council, mechanical power is the real monarch, and sorcery the demon enemy of the empire. Evelina has secretly mastered a coveted weapon - magic that can run machines. Should she trust the handsome, clever rake who speeds her breath, or the dashing trick rider who would dare anything she would ask? The story revolves around Evelina Cooper, Sherlock Holmes’s niece. With her rather unusual upbringing (she grew up in a circus, no less), Evelina doesn’t fit in with London’s high society. Her interest in various steam-powered trinkets and her penchant for magic only make things worse. However, as an outsider with inside connections, she is uniquely qualified to solve mysteries, even though no one else seems to think so. A Study in Silks occasionally tries to do too much, but still drags a bit due to its unusual length. The pacing is slower, and Evelina sometimes just isn’t strong enough to carry it. Admittedly, Holloway has great talent for writing action scenes so those parts proved to be incredibly entertaining. 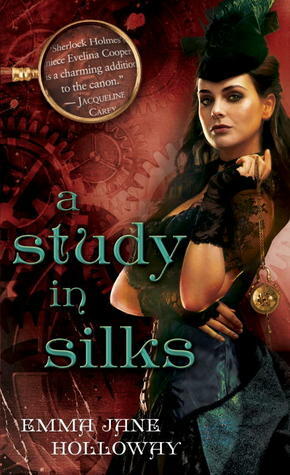 Her writing is fairly clean and light, completely unlike Gail Carriger’s witty style. True fans of one mister Sherlock Holmes might struggle a bit with this book. Holloway’s portrayal of this well known and beloved character has very little to do with the original, which might be irritating to some. Doyle’s Sherlock is a misogynist, he is a drug addict and impossible to live with. Holloway’s version is too mild in comparison, completely unlike the skeptic we all know and love. I’ve seen him described as sweet by several reviewers, and while Sherlock may be many awesome things, sweet he most certainly is not. I saw no reason for the introduction of this character and I thought the book would have been much better without it. As for the romance, there is a prominent and rather painful love triangle, which I resented. That aside, though, Holloway understands that infatuations aren’t meant to last and that young, inexperienced people often see what they want to see in others. As a true romance fan, I struggled a bit with these parts of the book as well, but intellectually I appreciated Holloway’s bravery and the path(s) she chose to take. There haven’t been any new books since 2013 as far as I can see, but fans of steampunk should read the three that have been published, as long as they’re not too sensitive about Holloway’s artistic liberties with the character of Sherlock Holmes. Darn. A love triangle is a great way to ruin an appetite. Hmm I think I would struggle with this. Thanks so much for the honest review! I was a bit curious about this one, but it doesn't sound like the right Sherlock story for me. I don't like love triangles unless they REALLY work, and it seems to be a bit too slow paced. I really enjoyed both this one and book 2, because I like how the author played with the Sherlock dynamics and built her own thing, but I've still to finish book 3... hopefully one of these days! Hmmm, I think I'll be skipping this one, mostly because of the love triangle tbh. But I'd also probably be bothered by the unrealistic representation of Sherlock, so I think I'll look for different steampunk reads. Thanks for such an honest and helpful review, though, Maja--beautifully written, as always. I don't mind taking liberties with other well known characters, but I'm not sure I would like this Sherlock. Might have to try it because you peaked my curiosity since I do like steampunk but I'm still unsure b/c of that triangle. Hm... got me thinking! I was really bummed when NG rejected me when I requested this book, but now I'm kinda glad. I love Holmes but this book will not work for me. Not being a Sherlock fan, I have to admit I'm usually put off when I see anything to do with him. That and the length of this one probably means I won't be reading it.